Sleeping 4 to 6 guests, here is a wonderful, fresh, warm and welcoming self-catering Apartment located on Cork Street, superbly easy to move about downtown Dublin from. Everything fully prepared for your stay and kitchen stocked with fresh groceries, you will check into an instant home-from-home on arrival. With 2 double-bedrooms (California Kings or Twin Beds in each), a fold-away single bed for Bedroom #2, and further sofa bed in the Sitting Room, the apartment sleeps 4 to 6 guests overall. Bedroom #1 is en suite with a walk in Shower Cabinet, and the Main Bathroom is complete with standard-size bathtub plus overhead shower. There is full Cable/Satellite TV service and full Wireless Broadband Internet for your use, plus all mod cons and fully equipped kitchen, dishwasher, washing machine, & separate dryer; with private underground parking available for 1 car/SUV. Overall size of the apartment is apx 900sq ft, and we would be so Delighted to warmly welcome you in for this very special time in Dublin City and Ireland. Dear Guests, myself and family returned to Ireland having lived overseas for many years, and although Much enjoying our own worldwide trips & travels in those years, we quite hated being ‘out of our home’. We experienced those pro’s and con’s of staying in hotels versus short stay apartments, and – the privacy and relaxation of a sensible, well stocked apartment always won out! Putting all of this into practice in our Dublin city centre apartment, we’ve become further committed to how nice is it to offer this hidden haven to our fellow world-travellers! Working hard on the things that count – excellent wifi & tv services, fresh bed linens & warm duvets (with beds fully made up prior to yuour arrival), and fridge freshly stocked with sensible & useful groceries and food Items, we’re sure we’ve got things superbly on-point. Plus useful guides – to the apartment, and on enjoyable trips and tours to make in the city centre and wider and countryside. Our goal is that you quickly settle in and get going with all this! So many wonderful activities, explorations and small adventures awaiting you on a visit to Ireland, including a lively engagement with everyone you meet on your tips and tours... a magical time we’ll always hope! Dublin is a Wonderful town to visit! - a bustling international city sitting on a long river and a broad natural bay between beautiful Howth and Dun Laoghaire Pier. There are Many cultural and social activities & events running all over town making for a great sense of things to be done and people on the move. Downtown, there is a great atmosphere amongst thousands of locals and international visitors and OUR OWN VERY LOCATION captures this sense of being at the heart of matters, yet not too close for eternal noise and disruption. You’ll have a clever and comfortable home-home with quick and easy access to all the fun, yet a wonderful respite from all the busy-ness. With so many festivals and activities throughout the year Dublin thrives with an abundance of meeting places - restaurants, bars, coffee houses, and of course! –a unique array of cosy, warm traditional Irish pubs where a hot fire, fresh Guinness, live music and the chat always await you. Come on over for some excellent human interaction, fun, warmth and the chat! •	Ease of transporting yourself around the city center. •	Excellent location of corner Grocery Store, ATM, & large Lidl Supermarket so close by. •	Location of Taxi Company Bookings Office at ground floor level (VIP Taxis). •	Excellent public transport/bus services on Cork Street. •	Easy proximity to Luas Tram line (redline). •	Excellent WiFi broadband & Cable TV in apartment. •	Everything superbly fresh & clean with Top Quality bed linens and furnishings for your stay. 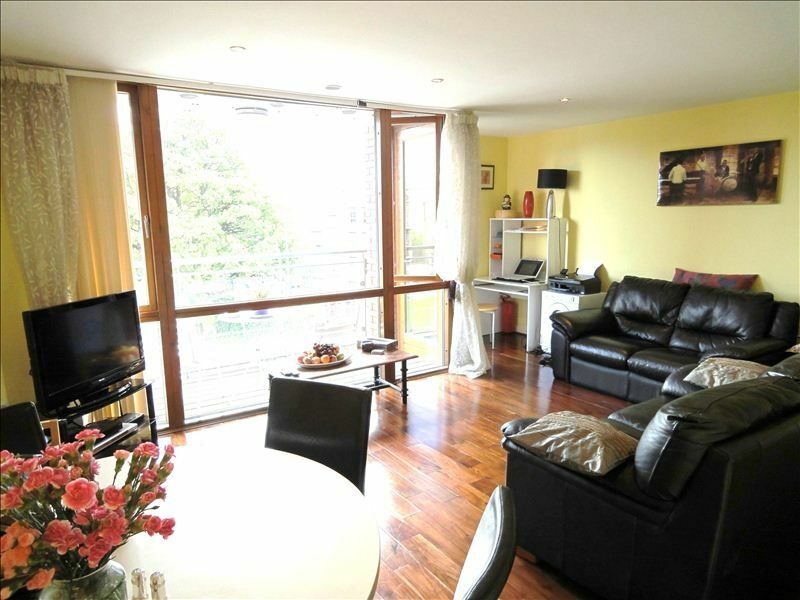 •	Truly peaceful, quiet bedrooms located at back of the apartment, overlooking Guinness Storehosue in the near distance. •	Feel so warmly ‘at home’ when you’ve had enough of city hustle and bustle. This bright & airy apartment overlooks a small but charming park with some delightful old Oak Trees. Plus, a nice view of the Dublin/Wicklow mountains. All beds freshly made up with 100% cotton sheets, anti allergy duvets, pillows + pillow cases, fresh bath & hand towels. Private & secure underground car parking slot available. Hi Speed broadband and wireless internet is available in all rooms. Epson Stylus printer DX8400 available for printing/scanning/photocopying. Fully fitted modern kitchen: all equipment in place for truly enjoyable dining-in. Nice collection of young children's videos: Disney films, etc. Comfortable outdoor terrace with coffee table and 2 chairs. Hop on a bus for easy access to central Dublin: Dame Street, Temple Bar, Trinity College, and Grafton Street. Or 2 min walk to Luas tramline for unique tramride to Jervis Street, Henry Street, and O'Connell Street shopping malls. VIP taxis available in minutes. Visit the Guinness Storehouse museum - just a few streets away for a truly memorable taste of Dublin! Clean quiet cozy and well stocked. This is a bit out of the city but easy to get a bus or taxi. It is also walkable to all main sites. Great to have food and a washer and drier. Highly recommend. Very comfortable apartment. Good location. Friendly and helpful staff. 2 bedroom and 2 bathroom with a separated living area for the early riser not to disturb everyone. This was a great apartment and location, especially for the price. Close to stores made shopping for groceries super easy. It was wonderful. Great central location without being right in the middle of all the foot traffic. Nice, clean, and quiet. We had a blast. Although it was a short four night visit, we found the apartment to be our home. Everything was ready for us including helpful directions and snacks! We would stay here again, for certain. Exceptional! Lovely, comfortable flat. An excellent welcome! We were enthusiastically greeted by the kind owner who had done a first shopping of essentials for us. So kind! The flat was quite centrally located for everything in Dublin. Easy access to transport and shopping. A roomy and comfortable home base for our travels! I must also mention the ease of booking, clarity of agreements and helpful flat instructions. The entire process was a breeze. Thanks so much! Additional Fees - one-time Preps Fee of euro180/- provides for Deep Clean prior to every Check-in, beautiful fresh Bed Linens, plentiful supply of fresh Towels, starter toiletries, beds fully made up prior to your arrival. And, our generous, wholesome Welcome Basket of fresh groceries awaiting you in the Kitchen and Refrigerator. - fresh milk, butter, breads, bacon/eggs & sausages, cereal, tea, coffee, fresh fruits & salads, snacks, and some chocolate treats - all yours to enjoy! Private Parking fee is euro15/- per night. Only if required; please ensure to book a parking slot when confirming your Booking. Departure-time Laundry fee euro40/-. We operate a sensible Cancellation Policy: please see Clause 7 of our Rental Agreement.